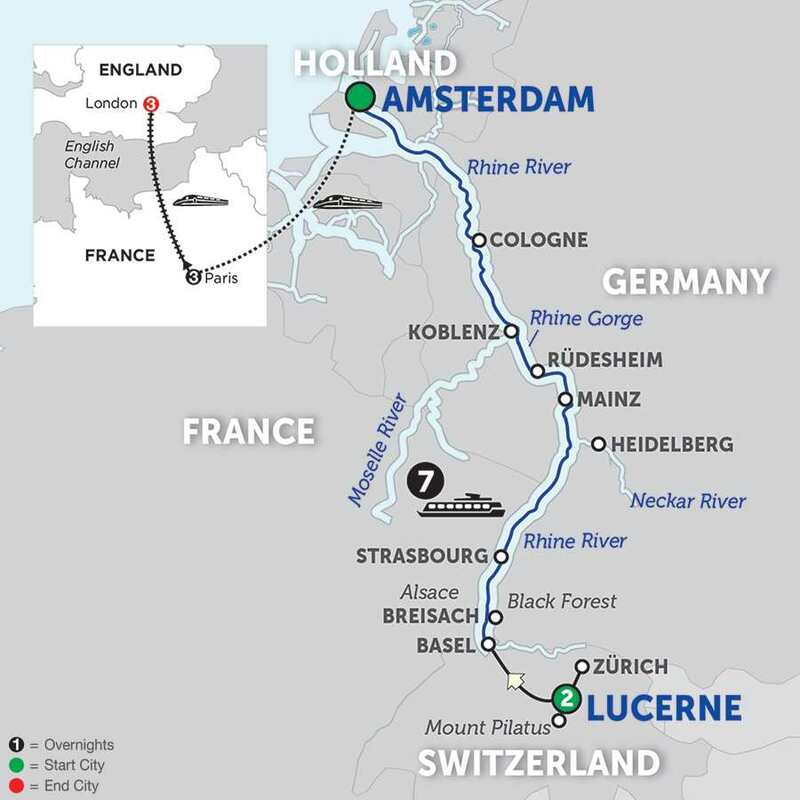 One of Europe’s most legendary rivers awaits you on this special winter voyage along the Rhine River. Enjoy glowing Christmas markets on your European river cruise across Germany, and touching in Holland, France, and Switzerland! This magnificent festive season Rhine vacation begins in Lucerne, with a guided walking tour including the Lion Monument, Old Town, Chapel Bridge, the Water Tower, Jesuit Church, and a special highlight excursion to Mount Pilatus. 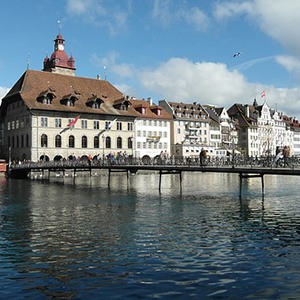 Board your vessel in Basel, Switzerland, then head for Breisach, Germany, the gateway to the Black Forest, an area of unrivaled natural beauty, best known for Black Forest ham, cherry cake, and the cuckoo clock. Here’s your first chance to explore a Christmas market offering many traditional items. Continue your river cruise to Strasbourg, France, where you’ll visit the red sandstone gothic cathedral with ancient murals and fascinating astronomical clock. Strasbourg is home to one of the oldest and finest Christmas markets in Europe and its centerpiece is a giant Christmas tree. Visit the ruins of Heidelberg’s castle, towering magnificently over the city, and watch the skaters on the ice rink below. Stop in Mainz for a guided walk and visit the captivating Gutenberg Museum. Next up is the charming wine town of Rüdesheim, and unique Siegfried’s Mechanical Musical Instrument Museum. You’re sure to be enthralled by the life-size figures of Europe’s largest nativity scene on the Market Square. Pass through the dramatic Rhine Gorge before arriving in Cologne—your last stop in Germany. Here, you’ll explore the 2,000-year-old city known for its gothic architecture and famous twin-spired cathedral. Wander through the Christmas market, try some traditional Lebkuchen and get some inner warmth with a cup of Glühwein. As an exclamation point to this wonderful Rhine river cruise, you’ll spend time in Holland’s popular, modern capital of Amsterdam. The best way to see the treasures of this 700-year-old city is on a canal cruise along the elegant grachten lined with homes dating back to the city’s “Golden Age.” You’ll disembark from your ship and travel by high-speed train to Paris to enjoy your Monograms vacation package with two nights each in Paris and London. Begin with a guided tour of the City of Lights, and see the iconic sights, followed by a Seine river cruise. Next, you’ll travel via high-speed train from Paris to London. Enjoy a guided tour with your local expert, and go inside St. Paul’s Cathedral, where Prince Charles and Lady Diana were married. Your Monograms Local Host® is available during your stays in Paris and London to assist you!